-I had an amazing dinner at Andrea and Tilmann's last night. His family was visiting from Germany and we had the most delicious food: red snapper, cod and tuna with an amazing dill cream sauce and potatoes and vegetables. The conversation was entertaining and on the way out, it was all topped off by spotting this Celtic (I assume) writing on a table that speaks so much to my time of discernment right now. How profound and hopeful. -The McNeills at church have adopted a new dog named Molly and they brought her to a lunch today and the Trinders and we all doted on the adorably scruffy salt-and-pepper colored pooch. She just reveled in the attention and you could tell that Sheila just adores her. 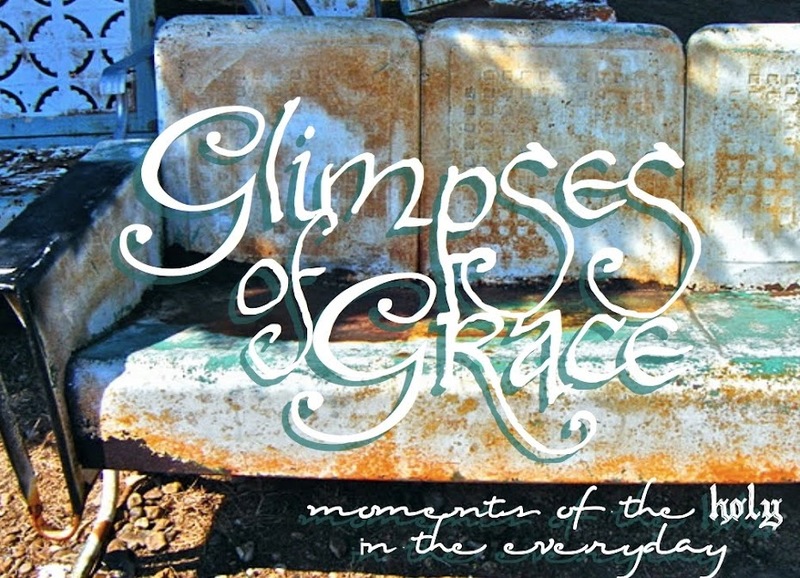 -My dear friend Rob writing a facebook note about "beating the late-winter funk" and saying to be on the lookout for the grace that abounds and mentioning my blog, which of course was a glimpse of grace in itself for me. -Teaching the primary school assembly this morning and telling them the story of the Good Samaritan and getting kids to act it out with me, including a cute little boy named Samuel, who of course got to be the Good Samaritan "Sam". -A terribly rainy, cold day that somehow didn't bother me too much. Walking back home, I actually enjoyed the vacant, drenched park and the rhythmic plink-plunk on my umbrella so much that I took a winding path I've never taken before just to see something different. -Taking about 20 Fitzroy young people to the movies to see a slightly-cheesy romantic comedy called "Leap Year" and realizing how amazing it is that this is my job. What fun! -I've decided to re-read all of the Harry Potter books and am having so much fun getting caught up in the story again, so much so that I steal little moments to read it, like whilst drinking my morning coffee. -Hearing from my sister's blog that she's had a really great day. Love you, Sista! -The "young at heart" ladies in Bible study (they're mostly in their eighties) deciding that after my having taught the last couple of Bible studies that I should just continue and teach them all "while they have me." I love engaging in the Word with them because they have such devout faith and poignant questions, and am so honored that they've embraced me so heartily. It's amazing how women who have never before worked with a female minister and who certainly would be accustomed to a traditional one have been some of the most devout supporters of my sense of calling. Plus, the homemade scones and earl grey tea aren't too shabby. After having a guy my age at a Presbyterian Church in Ireland full-time youth workers' day today say "so are you seriously ordained? No offense, but I don't see you as a minister...you look so young!" it's nice to know these more mature ladies have my back. I replied to this guy that I get that whole "you don't look like a minister thing" a lot, and that I consider it part of my calling to break the mold, to show young women that this is an option for them too. -Running into my friend Tura while walking and both of us popping our headphones out of our ears to engage in actual communication (as opposed to the sometimes-blissful, but always individualistic, iPod world). I had a day-and-a-half at my favorite place on this whole wee island, Craigantlet, on Saturday. The cottage we all stay in is owned by friends of Jonee who open it up when they're away on holiday for Jonee to come and bring friends. True Irish hospitality, there's nothing like it! So generous and kind. It was way too short, but a lovely time. It gave me space to cook, read, discern, sleep, walk, hang out with good friends and just be. -Waking up to find snow floating down and everything covered in fluffy white. Oh how I dreamed of getting snowed in at this wonderful place, but sadly it didn't happen. -I made pancakes with homemade blueberry syrup for breakfast and, as you can see, they didn't even last long enough to photograph! Very yummy. -It was an absolutely beautiful afternoon and I walked along the beach with Jonee and Andrea, skipped stones in the Irish Sea, collected weathered glass and seashells and even had a nice little sit atop a hill by the sea to sit, think and reflect while listening to waters rushing in and out around me. Scripture mentions the voice of God like the sound of rushing waters...I think it's right. -Playing with the wonderfully affectionate Casey (who didn't stay still long enough to take a normal picture!). She reminds me of the dog in Neverending Story in this picture. -The fabulous Sheena made us all a birthday cake (several of us had January birthdays, so this was a late celebration of them all). Chocolate with orange marmalade and extravagant, rich icing. After our beach walk we came in to warm up with a cup of tea and a huge slice of this each. Oh, wow. I spent a blissful afternoon and night at my favorite wee cottage in Craigantlet with good friends, so grace from that will be shared soon (including pictures! camera's up n' running again! 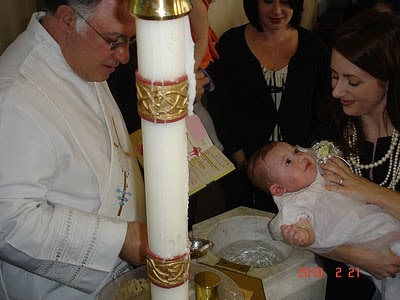 ), but the biggest grace today is that my precious niece Gianna was baptized at St. Anthony's in Bryan, Texas. I really wish I could have been there, but was glad to get pictures from it. What a holy and happy day. In Evolve (youth Bible study), we looked at PCUSA's Brief Statement of Faith again and particularly poignant was the part where it says the Spirit "claims us in the waters of baptism." You are claimed, dear Gianna. You belong to God and to us. -...a package from Jessi waiting for me! Her Presbyterian Women at her church decided to support my mission work by sending me an amazing care package which included a Lenten devotional by Frederick Buechner (my favorite!). Also included were gorgeous earrings made by Jessi, lots of snacks, cooking magazines, a made-for-me CD called "Whitney's Winter Mix", valentine's socks and Burts Bees! Oh joy! It was overwhelmingly thoughtful and kind and I felt so intensely the connectional church: where I can be thousands of miles away and know that people are with me in Spirit and ministry. Thanks to Jessi and the ladies of First Presbyterian Fayetteville, TN! -Trees and hills shrouded in mist, little icy puddles that crunch as I walk over them and seagulls swooping in unison overhead. -Sipping a mug of tea while reading Harry Potter. I don't know why I feel closer to Hogwarts here (maybe it's kids wearing 'prefect' badges and school scarves) but it's so fun to read all of the books again. -Getting really into the shrove Tuesday thing and eating blueberry pancakes for breakfast and dinner. They're so good! I'm really looking forward to Lent being a time of renewed vision and discernment, and am going to mass with Catherine tonight for Ash Wednesday (most Protestant churches don't do Ash Wed here). -This picture of Natalie and Gianna, the gorgeous nieces. It's my new background for my laptop (which is almost functioning like normal again). -A little girl with brown cascading curls and a giddy grin waving happily at me from her car window. -A big warm scarf and my favorite warm socks on a blustery day. The socks are made to mismatch and look like little hand-knitted sweaters for your toes. Perfect for days like this. -Celebrating Denise's birthday with the dance girls by going to the Garrick, where they cleverly had Amelie showing on a big screen in the back. We spent several minutes watching it, saying "Oh, I love this movie." -Waking up from a nap to see raindrops glistening on the window with a sunset behind them, making them look like diamonds. -The adrenaline rush and deep joy that comes with leading worship and feeling so blessed to do something I love. "A good friend of mine saw a glimpse this morning. a kid jump out, run over and give the traffic cop a valentine. She then said "This is why I love life." Thought of you." camera battery like I'd hoped, so back to square one on pictures! table and had a nice little catch-up. -Dinner with Dorothy, Pamela and Mark. Dorothy's just so fun. and now she has a lovely beach sunset to look at. music playing in the background just made it profound. -Sermonating on Lent: oh joy! I love it. -Tee and Toast gal at St. George's saying, "Hey! I found your blog! So I'm Tee and Toast Gal, huh?" -Talking to Hazelnut Latte Creator about Texas and how he's always dreamed of going to Austin and about the awesome South by Southwest music festival there and how the city works hard to support local business above big business. -Heading for the bus home and running into (not literally, but nearly) Dave driving. He offered me a lift home, and I offered him the carrot cake I had bought to bring to his house later for dinner. -Enjoying dinner and wine with friends and all that comes with it: silly music, stimulating conversation, food and more food and hilarious stories. -Talking to my niece on the phone and my mom saying, "Oh, she's beaming!" -Speaking to the young people about my take on the Gospel: that we belong to God and we belong to each other. We looked at an illustration from theologian Roberta Bondi: "Suppose we were to take a compass and insert the point and draw the outline of a circle… Let us suppose that this circle is the world and the center is God: the straight lines drawn from the circumference to the center are lives of human beings. So to move towards God, each individual must move towards the center… and the closer they are to one another, the closer each is to God." We also looked at scripture, my stories and A Brief Statement of Faith, which I just love. At the end, I had them close their eyes and picture someone who really annoyed them or who was mean to them and then they opened their eyes and I said with a smile, "You belong to that person, and they belong to you. Sorry, it's not easy, but it's the truth. We're all made in the image of God to be one family." -Having a bit of a cold and enjoying that deep, dreamless sleep that comes with being a little sick and really needing it. -Three words: caramel roobois tea. Oh, wow. Find it! I've stopped (my family with be shocked to know) taking sugar in my tea and coffee for this past week in an effort to just be a little healthier and this caramel tea might be cheating, but it's sooooo good. -Walking through the park on a particularly cold, grey day and feeling a little grumpy about it all. As I walked, trying to shake off my tiredness, I thought I should just try the whole "St. Anna" prayer to cheer me up. Well, I began in my mind: "Thanks be to God for this day. (sigh) For all that is above me (lots of grey sky), for all that is below me (cold, dark, wet ground...)" and quickly realized that this was not really helping. Remembering that God would much more prefer an honest prayer to a cheery one when I just wasn't all that cheery, I was comforted. And so I grumbled to God, knowing that God is gracious enough to accept even my grumblings. And that is grace. -Incredible timing, and feeling Someone bigger than me at work. -Copious amounts of hot, cinnamon-infused coffee to keep me warm and alert and wishing for a sandwich, but not having the conviction to go out in the rain to seek it. Roberta texted saying she was on her way to the office. I replied that I'd just made fresh coffee and she said that sandwiches were on the way. -A little boy in Religious Education at the primary school saying that his news was that he was very sad (but didn't say why). At the end of the lesson, sort of out of nowhere he said, "I've been told that when someone you love dies, they can still see you from Heaven. Is this true?" Chris and I replied that we really did think this was true, and he smiled to himself.